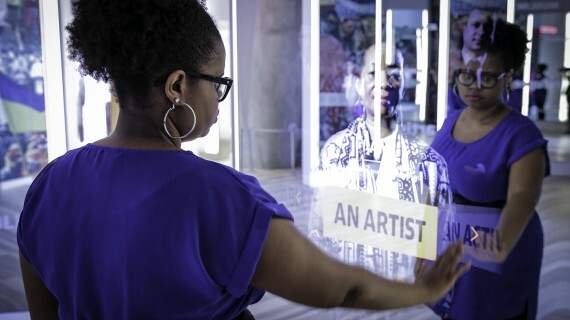 “Who, Like Me, Is Threatened?” is a unique interactive mirror experience that serves as an introduction to Spark of Conviction: The Global Human Rights Movement at Atlanta’s Center for Civil and Human Rights (CCHR). The gateway into the gallery both literally and figuratively, it helps visitors forge an emotional connection to difficult content, leaving an impression that stays with them long after they’ve departed the museum. The installation utilizes first-person storytelling to put a human face on complex problems that can otherwise seem abstract and unrelatable. As visitors approach, depth-sensing cameras respond to their presence. Gazing into interactive mirrors, they see strangers looking back, each labeled with a single identifier: “I am ______________.” Visitors choose a label that resonates with them—options range from “LGBT” to “Muslim” to “black” and beyond—and watch video interviews with individuals who have been persecuted because of that trait. They get to know a Saudi Arabian woman battling sexual harassment and discrimination. They encounter a labor leader from Liberia who was once sentenced to death for his efforts promoting workers’ rights. They hear about the obstacles faced by a lesbian from Nicaragua. The stories are poignant and surprising, true testimonials from a diverse cross-section of people from around the world. The installation’s location at the beginning of the gallery coupled with the importance of the subject matter presented key obstacles for our team. “Who, Like Me, Is Threatened?” had to be provocative in order to hook the visitor, but how do you shock people without alienating them? And how do you create an experience that draws in the public while staying mindful of the delicate nature of the issues being addressed? Our team confronted both of these challenges head on. Seeing human beings reduced to a single word is instantly jarring, but the powerful video pieces we produced offer each subject added dimension. Standing face-to-face with the interviewees and listening to them talk, visitors gain a more acute awareness of the danger of these reductive labels and the many ways in which one’s rights can be compromised. Seeing themselves literally reflected in those sharing their most traumatic memories puts visitors in an empathetic, receptive state of mind as they continue through the gallery. To ensure an engaging and authentic yet respectful experience, we took our responsibility as storytellers very seriously. We collaborated with Human Rights First to establish a comfortable, supportive environment for our interviewees where they felt free to speak openly about the injustices they had suffered. Intimate and unscripted, the resulting pieces honor the weight of the content. In the end, “Who, Like Me, Is Threatened?” is as much about our similarities as our differences. Memorable, unexpected, and moving, the experience collapses the distance between us by shining a light on what we all have in common: our humanity.